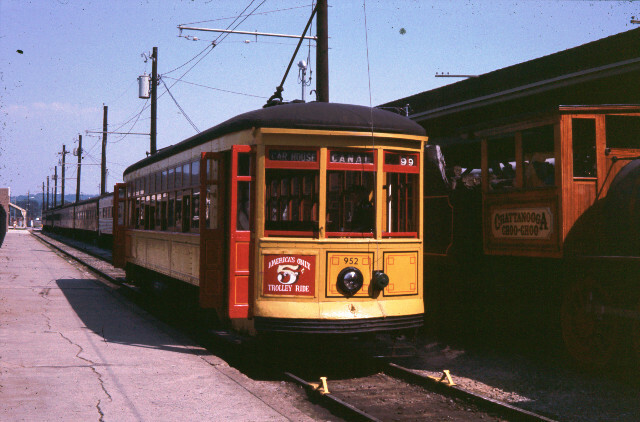 When the original Canal Line closed in 1964, several Perley Thomas cars were sent to museums and heritage streetcar operations around the country. 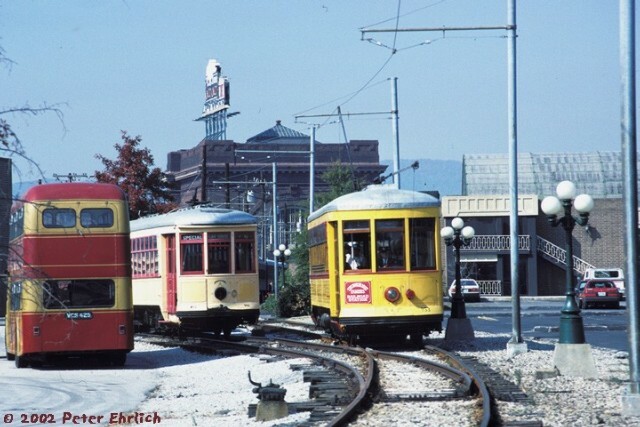 The Chattanooga Choo-Choo Hotel acquired two, cars 952 and 959. The 959 was renumbered 953, and both were painted in the striking livery seen here. At first, the 952 was used in service (upper picture), but after it had deteriorated somewhat, 953 (ex-959) was called up as its replacement, and 952 was stored, as can be seen in the lower photograph dated October 17, 1987. Note the change in roof color from the upper picture to the lower. — lower photo © 2002 Peter Ehrlich; used with permission.